Live coverage of the Dutch violinist and composer in concert in his home town of Maastricht. 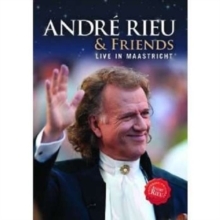 André Rieu is one of the bestselling modern classical artists, with over 20 million sales worldwide and a string of successful tours behind him. This concert sees Rieu and the Johann Strauss Orchestra take to the stage in an open air event in the historic Vrijthof square at Maastrich. Rieu is also joined by a number of very special guests.